Case’s three-pronged strategy to develop its business in the region – which involves strengthening its dealer network, building the brand, and developing its product offering – is paying rich dividends, according to a senior official at CNH, its parent company. According to him, the company’s strategies are hinged on three main pillars. “The first one is aimed at strengthening our Case dealer network. Over the last three years, we focused on scouting for new partners to cover the remaining territories in the region. We are also focusing on quality through a partnership programme we launched last year. The Pinnacle Excellence programme aims to develop our dealers and work with them to achieve the highest standards in customer service in the industry,” he explains. 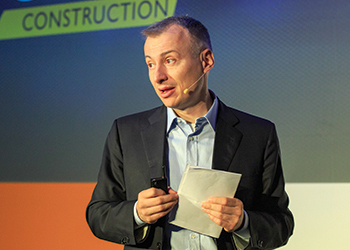 The second pillar is brand building which, according to Invernizzi, was best showcased at the recent Intermat construction equipment show in Paris, France, where the company’s stand was one of the biggest, making a strong statement about the extent of its commitment to the brand and investment in its future. “We will carry this strong message to all the major shows in the Middle East as well as numerous open house and local events that will take place across the region,” he reveals. “We are extending our offering to include new products specifically designed and engineered to match the requirements of our customers in this region. Just to mention a couple, we recently launched the 570 backhoe loader and 1107DX compactor. Case demonstrated these machines alongside the range offered in the Gulf at its customer care centre located a few kilometres from the exhibition ground during Intermat. “More products will come as we go forward. Our approach is to introduce products that are complementary to our current range in order to cover better other segments of the market that have been growing in the Gulf,” Invernizzi said. According to him, Case’s product offering is complemented by its services, which it continues to enhance by introducing maintenance packages, retail financing, and telematics to better fit the business needs of its customers in the Gulf. Invernizzi said the potential for growth in the Gulf region is huge. “The Gulf region has become increasingly important for CNH Industrial. In the last few years, we have further developed our Dubai office, and today it hosts our sales, service, parts teams, CNH Capital and our financial branch. “Local presence in the region is key, and Dubai is a good hub to reach every part of the Middle East and most of Africa. We have a plan to move more and more operations and people to our facilities in Dubai. “All the main CNHI businesses – from trucks to agricultural and construction equipment – are committed to investing further to build their presence in the region,” he added. “Gulf customers always prefer to see the machines operating in real conditions, and at our Customer Centre they have also been able to test them,” Invernizzi said. Invernizzi hailed the role of Case Construction’s partners and distributors in the Gulf, which have helped the company penetrate the market. The mix of established and new partners in the network is turning out to be a “winning formula” for Case in the region, he added. “Both Roots in Saudi Arabia and Al Shirawi in the UAE have achieved the ‘Pinnacle dealer’ status in 2014. They are benchmark and a source of inspiration for the rest of the Case dealer body,” he said. Roots is a relatively new partner for Case but it has already acquired a stable position among market leaders in the Saudi equipment market, he said. “There is room to grow further, and we will help Roots to deploy the full potential of its organisation and of the Case brand in Saudi Arabia,” Invernizzi remarked. Al Shirawi has been Case’s partner in the emirates for almost 20 years now, and the collaboration is going from strength to strength, he stated. NBK Group in Qatar is Case’s oldest partner in the region. “We are working together to grow our presence in this booming market,” said Invernizzi. The company is also aiming to strengthen its presence in other areas of the region like Oman, where it is now looking to select a partner for Case who, according to Invernizzi, must possess financial strength, excellent connections in the local market, construction equipment expertise and, most importantly, quality people. Case Construction supports its agents and partners in the region by helping train and develop their teams through web-based or face-to-face sessions. “Our help desk is available 24/7 to provide answers to technical or commercial queries. The fact that the Case brand is backed by a powerhouse such as CNH Industrial gives us and our partners a clear competitive advantage,” he said. Case machines have remained popular in the region, thanks to their proven abilities to overcome challenges posed by the harsh climatic conditions. “All our new machines are extensively tested in this region to ensure they can deal with some of the harshest conditions on the planet in terms of temperature, sand and remoteness. This is our testing ground – we have to be sure that our machines work perfectly here and can easily cope with the rigours of this region before we launch them anywhere else in the world,” Invernizzi pointed out. Case Construction will continue to strengthen its business growth in the region through key events such as Case Eagle Days. “Later in the year, we’ll hold the first Eagle Days event in the Gulf. It will be a mix of training and customer presentations,” Invernizzi concluded.